Nicole Dyer, of FamilyLocket, has created a “Family History for Children” blog link up. 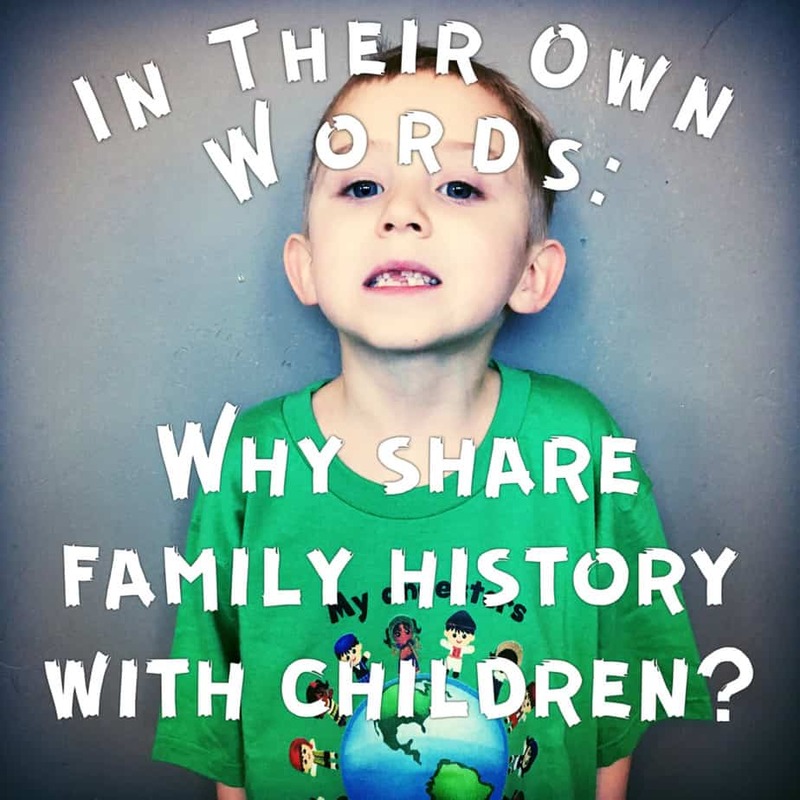 This month’s theme is “Why Share Family History with Children?” It is my pleasure to participate in this blog link up about a topic dear to my heart. I have shared before about how I got started in genealogy as a young teen, and how I incorporate family history with my children’s school studies. I have written about making family history a part of family road-trips and vacations, and why I share short video stories and small social media bits about my family history to appeal to the younger generation. **These young people are all members of the Church of Jesus Christ of Latter-day Saints (LDS or Mormon) and many of their thoughts include their religious beliefs on the subject. I have lightly edited their remarks only for spelling, grammar and clarity. Why do you think it’s important for youth and children to be involved with family history? How does knowing about your family history as a young person help you? Wow! I am inspired by their answers. In summary, I saw a theme that knowing their family history brings these young people happiness, peace, enjoyment, connection and spiritual strength. What more could we want for our children? What a great post idea! I was expecting to see what your children had to say. Maybe that will come out in the future? 4 out of 7 of the comments are from my children. My oldest and youngest two did not have comments to share at this time. What vision these kids have! Thanks for taking the time to ask them these questions, Melissa. Aren’t their answers remarkable? And I purposefully gave them the questions and left it wide open to their interpretation. What vision these kids have! Thanks for taking the time to ask them these questions. Thank you for sharing the insights of children and youth. Their testimonies strengthen me! You are welcome! Their words strengthen me too. Our family is related to George Manwaring’s brother too, like Cooper! We love to talk about him and sing “Joseph Smith’s First Prayer.” Thank you for sharing these inspiring thoughts! What a small world! That is wonderful. Reading these comments gives me great hope for the future. In the midst of turmoil and negativity, these youth have such a strong foundation going forward. I loved this post, thanks for taking the time to put it all together! Thanks, Diana. We have a bright future with our children indeed! Wow what a fun idea and incredible answers! So inspiring, thank you for sharing! I loved the last girl’s comment when she says “come on people there are more than just one branch! ” Yes!!! This ten year old gets it! Absolutely, she feels the call to genealogy work and is not afraid to preach it! Love it. Thanks for reading, Alexis.